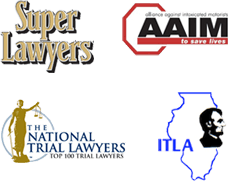 How Can a Chicago Traumatic Brain Injury Lawyer Help Me Win My Case? Traumatic brain injury (TBI) usually results from a violent blow or jolt to the head. Additionally, any object penetrating the skull, such as a bullet, can cause a traumatic brain injury. The Centers for Disease Control and Prevention estimates that at least 1.7 million TBIs occur nationally each year. TBIs can range from mild, which can include a brief change in mental status or consciousness, to severe, which can involve an extended periods of unconsciousness to amnesia following the injury. Sever TBIs can also lead to long-term medical issues or death. About 75% of TBIs each year are concussions or other mild TBIs. The CDC also states that TBIs can cause epilepsy and increase the risk for brain disorders that become prevalent with age, such as Parkinson's disease or Alzheimer's. What Are Some Common Causes of Traumatic Brain Injury? Falls – Falling out of bed, slipping in the bath, falling down steps, falling from ladders and related falls are the most common cause of traumatic brain injury overall, particularly in older adults and young children. Vehicle-related collisions – Collisions involving cars, motorcycles or bicycles — and pedestrians involved in such accidents — are a common cause of traumatic brain injury. Violence – About 10 percent of traumatic brain injuries are caused by violence, such as gunshot wounds, domestic violence or child abuse. Shaken baby syndrome is traumatic brain injury caused by the violent shaking of an infant that damages brain cells. Sports injuries – Traumatic brain injuries may be caused by injuries from a number of sports, including soccer, boxing, football, baseball, lacrosse, skateboarding, hockey, and other high-impact or extreme sports. What Damages Can I Receive for My Traumatic Brain Injury Claim? Traumatic brain injuries can result in ongoing medical issues that can affect a person's ability to work or perform other daily activities. In the event of a TBI caused by the negligence of another person, the responsible party may be liable for the victim's medical expenses, lost wages, rehabilitation, pain and suffering, etc. Injuries suffered as a result of traumatic brain injury can be severe and life changing. At Nemeroff Law Offices, we help individuals and families overcome these challenges and recover the necessary compensation for medical expenses and future needs. Our firm has an extensive rolodex of qualified experts in many fields necessary to help prove your case, including medical doctors, economists to discuss your past and future wage loss, life care planners to discuss your future medical care costs and many other experts that will help to increase the value of your traumatic brain injury case. Our firm represents clients or loved ones of clients located in the Chicagoland area and throughout Illinois who have suffered severe brain injuries. We offer a free consultation to evaluate your traumatic brain injury claim. It will cost you nothing to consult with a lawyer to see if you have a case. The Chicago traumatic brain injury lawyers at Nemeroff Law Offices will ensure that action is taken promptly to preserve evidence, investigate the accident and/or conduct in question and to file a lawsuit, when necessary prior to a deadline imposed by the Illinois statute of limitations.